Using a geoboard to create a spider is a great way to sneak in some fine motor and motor planning skills during an October/Halloween themed My Obstacle Course. My geoboard spider (I always try out activities beforehand in case they don't work.). This is a super easy station to set up, all you need is a geoboard and some rubber bands (which the geo board comes with). 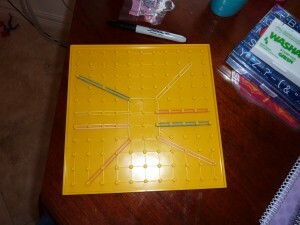 Click here for the Geoboard Google Search results as well as a picture of a geoboard with rubber bands creating what looks to me like a spider web – another way to use it with this theme!! I began the rubber band spider with a rectangle body and Andrew’s job was to create the 8 legs, 4 on each side. This requires using both hands together with one hand either holding the peg with one end of the rubber band around it or holding the board so it doesn’t move and some hand strength with the other hand to be able to pull the rubber band to stretch it all the way over the peg. Andrew working to make his geoboard spider. See how he has to use two hands together to stretch the rubber bands? 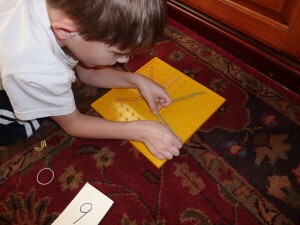 Children generally enjoy working with geoboards because they rarely get to “play” with rubber bands. Ever watch an adult with a rubber band? There’s just something about them that keeps fingers and hands busy while stretching and twisting them – so fun!